Home » Mobile Money » We’ve figured out payments, so what’s next for Zim e-commerce? Last Saturday Paynow, a local e-payments integration service, hosted a developers’ day at the Hypercube Hub. The event was attended by several developers and designers with some of them eager to integrate Paynow with their online services. Matthew Hood, the technical lead at Paynow, was pleased with the turnout at the Developer day, largely because of the impressive systems that the developers were bringing for integration. Some of the developers and designers had web based solutions and apps that had been shelved because they didn’t have a simple payments solution for their system. Beyond the success of the developer day the event marked a huge leap for e-commerce in Zimbabwe. Two aspects whose conjoining has a huge bearing on e-commerce success, payments and system development, where brought together in one space. Paynow, although relatively new, has not only come off as an all encompassing, simplified payments integration option. It has managed to reach out to the guys who have been directly involved in creating e-commerce platforms but needed a solution for the local online payments challenges. Granted we have had some impressive workarounds before Paynow (solutions like Pay4App and vPayments come to mind) but the impressive move made by Paynow here is reaching out to the people who have been trying to or intend to make something out of local e-commerce opportunities. Currently the local ecosystem is littered with startups that have been angling at e-commerce and online retailing with varying success. While their efforts have slowly brought people to appreciate online services, there has been no e-commerce site or application to really kick the Zimbabwean e-commerce revolution into high gear. We are still looking for our shining example of how e-commerce has truly arrived in Zimbabwe. We can attribute this to several factors, one of which has been up until now the issue of payments. While we might get divergent views on whether or not our country is ready to do business online, crossing of payments from that list brings us one step closer to experiencing that huge wave that we have been anticipating ever since dollarisation. Other pieces of the puzzle that are already in place include the increasing internet penetration rate, a highly consumptive society and the absence of exchange rate woes (thanks to the borrowed currencies). However, the most significant component in all of this is the acceptance of a cashless culture that has been facilitated by the mobile money revolution. With the successes of mobile money in other African markets translating to a greater uptake of e-commerce services, the same wave is likely to hit Zimbabwe because we offer similar growth prospects for anyone willing to take the risk. The local MNOs have a greater incentive to see this happening because of the huge opportunity of mobile money and the decline in voice revenue. These operators have been gearing up for greater m-commerce activity with expanded options for mobile wallets and more investment into the same business line. Some have even hinted that they are going to have a go at e-commerce themselves. First of all whoever wants to make a huge splash in e-commerce has to figure out the logistics side of things. If I’m buying goods from a trusted wholesaler or e-tailer it makes sense and would be great to have them delivered to my doorstep or at a convenient location. A lot of innovation will be needed to come up with appropriate solutions for this challenge, and it will take active involvement from stakeholders in logistics willing to see the long term opportunity of the e-commerce. Perhaps this is where Zimpost needs to come in aggressively as part of their turnaround plan. Not surprisingly the Paynow team has considered this and confirmed that they are exploring possible solutions for this through strategic partnerships. We are keen on seeing how they will solve this, together with the other startups in the trenches trying to figure that one out as well. If that is taken care of in the short or medium term we’d still need to see competitive pricing from online merchants. Beyond the noise surrounding payment options, logistics or web stores that look great and function perfectly, if it its not priced right it won’t be bought. I might as well catch a kombi and go and pick up the product myself. The e-commerce landscape has changed drastically in the last 24 months but what lies ahead in the next year will answer the question of how ready we have been for it and where it goes to in the future. How do you think local e-commerce is likely to take shape in the next two years? Feel free to give us your opinion in the comments below. We at ZSS think PayNow is brilliant. As the article implies, the eCommerce payments options for Zimbabwe are in place… It is now down to the merchants and the consumers to take the steering wheel and drive this new delivery channel nation wide! Just a few points on the article above. It is wrong to compare PayNow and Vpayments… PayNow is a “payments gateway” as is Pay4App, where V-payments is a “payments processor”. 2) Visa and Mastercard – CBZ Bank is now offering (legal) Visa and Mastercard options for Zimbabwean merchants. This is especially useful for diaspora consumers who can now shop securely and legally on Zimbabwean eCommerce sites using this CBZ option…. from anywhere in the world! There are also some Zimbabwean issued Visa and Mastercards in circulation from Zimbabwean banks, but this count is minimal when compared to the total national card base. Regardless of where the card is issued (within Zimbabwe or abroad) the transaction is processed internationally by Visa / Mastercard, attracting additional charges. 3) EcoCash – I do not have figures for this but do understand that there is an eComemrce APi for merchants to integrate to. While EcoCash now has a MasterCard, this will only be useable on MasterCard enabled Zimbabwean sites as per (2) above. I am not sure at this point if EcoCash will be integrating into ZimSwitch through Steward Bank to enable V-payments integration. 4) TeleCash – I believe there is a dedicated TeleCash API available for eCommerce merchants, but with the launch of the new TeleCash Gold Card, TeleCash customers will be able to use V-payments through ZimSwitch. The brilliance of PayNow is that it offers all payments options under one roof and allows the consumer to choose which payment option they would prefer. eCommerce customers can shop at PayNow integrated merchants and benefit from multiple payments options.. We are firm believers in the “ecosystem” approach, and PayNow based models really do give consumers the power of choice. 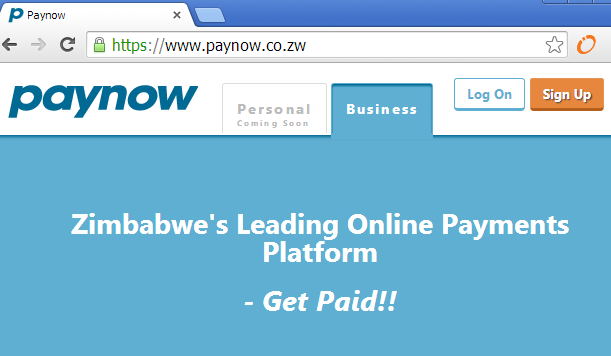 However just to clarify, PayNow is not a payments processor – more a Payments Gateway… Please email support@zss.co.zw if you would like to discuss further or require any assistance with your ecommerce site integration. What’s next? Faster, cheaper and decentralised payments solutions where you don’t have to first verify your identity and provide a proof of residence before you can participate and where you can send money across borders without asking for permission. David Johnston hit nail in the head when he said, “Everything that can be decentralised will be decentralised”. This is a good development. There is a lot of opportunity in our virgin country that startups should take advantage of. Now that we have a payment gateway that can be integrated online, let us take advantage. I also urge developers in Zimbabwe to try out international infrastructure and APIs. This reduces your costs significantly. I hear Paypal is on its way. Try Cloud Computings esp with Softlayer (IBM), Amazon, Rackspace. You get instances as cheap as 7cents per hour. Make use of good APIs like MandrilApp (for emails), Facebook Graph, Paypal that way we improve our skills as we build better and more robust applications. Great that this is now a reality, seems though we need the commerce to fuel the e-commerce first. What I am hoping is that we stop thinking locally and start thinking globally, yes we can now process payments locally but perhaps we’ve all been thinking inside of the box for far too long and the inside of the box isn’t what the tech/e-commerce scene needs. The next few months will be interesting with everyone bringing their “Hidden” gems out the closet. Lets hope some of the traditional brick and motar establishments see this as a way of reducing costs and expanding reach, benefiting both the consumers and their bottom line! Congrats to the team behind PayNow!